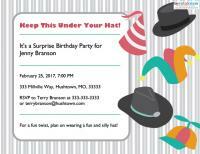 Creating great surprise birthday party invitation wording isn't a secret. The most important thing to include is a warning to keep the party a surprise from the honoree. Beyond that, be creative and come up with something fun for your surprise party invitations! We're having a birthday party. Name hasn't a clue. Keep it a secret. We're counting on you! Keep This Under Your Hat! For a fun twist, plan on wearing a fun and silly hat! 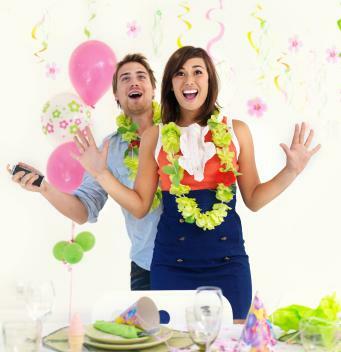 Check these birthday surprise ideas out! Mark your calendar, save the date. . .
it's a surprise, so don't be late! 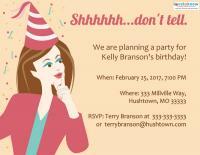 We are having a surprise birthday bash for someone you know. Guess who is turning 50? Yes, it is a surprise. Name has no clue - but now YOU do! Shhhhhh...don't tell. We are planning a party for Name's big 4-0! Come take a walk down memory lane. There is a surprise birthday party for Name on date and time. Bring any silly pictures you may have and we will create a secret display to be given to our guest of honor on his/her special day. Can you keep a secret and promise not to tell? 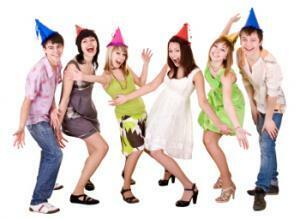 Name's birthday party is to be held on date and time. Please don't be late! All guests are asked to dress in their favorite football jersey since Guest of Honor is a big sports fan. Feel free to use any of these ideas directly, or let them serve as inspiration for your own creativity. 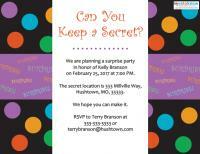 As long as you don't overlook emphasizing the secrecy of the event and you remember to provide party details, like when, where and how to RSVP, you can go with just about any wording option you like.